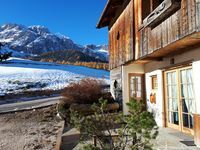 Cortina, 10' walk to town, ski-in ski-out, unbelievable view, romantic attic with fireplace: really a nice place to live! Property 19: Cortina, 10' walk to town, ski-in ski-out, unbelievable view, romantic attic with fireplace: really a nice place to live! Crignes apartment a short walk from the center of Cortina, overlooking the Faloria. Property 25: Crignes apartment a short walk from the center of Cortina, overlooking the Faloria. Property 42: Tyrolean-style apartment with a wooden furnished stube. This ski chalet was perfect. We have never been to Cortina and had no idea of what to expect. We were 50 yards away from ski lift and just a short drive to the beautiful town of Cortina Di Ampezzo. We also walked it one day and it took about 20 minutes. Silvana was the perfect hostess and the chalet was spotless clean. We want to go back in the warm weather to hike this beautiful area.